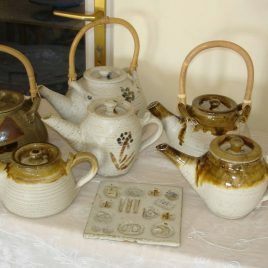 Alan Gaillard Ceramics and Irish Pottery is now in production at his eco-friendly studio in Clifden, Connemara. His studio is probably the first near-carbon-neutral pottery in Ireland as Alan generates 75% of all energy used in the house, workshop and studio with a wind turbine. Using all natural raw materials for his glazes Alan is again producing wonderful domestic tableware in immensely strong reduction-fired stoneware and also unique hand-built pieces, lamp-bases and commissions.